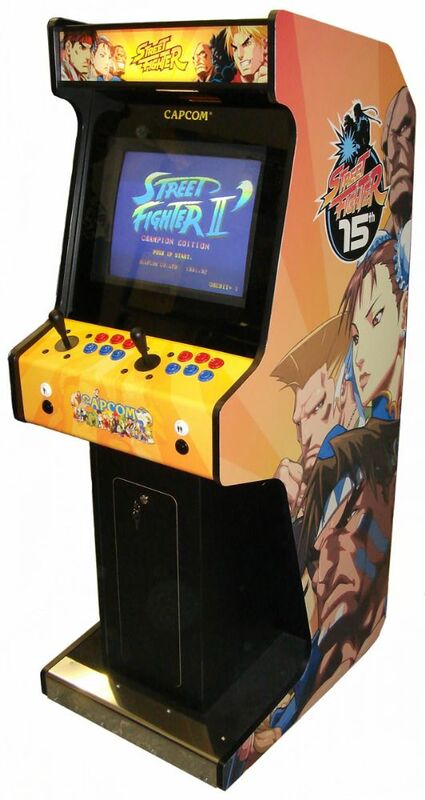 SUPERB ARCADE MACHINE FEATURING STUNNING SIDE ART GRAPHICS AND OVER 300 GAMES! This is the latest addition to the range - The Astral Fighter. This machine features a 2 joystick and 6 buttons per player control pannel layout, making it the ideal choice for all fighting game fanatics. The Astral Fighter comes with over 300 games, including many versions of Street Fighter, plus all the retro classics that we all know and love, such as space invaders - pacman and many more. This is the latest addition to the range - The Astral Fighter. This machine features a 2 joystick and 6 buttons per player control pannel layout, making it the ideal choice for all fighting game fanatics. Only arcade quality components are used for the control panel (Happ pushbuttons and Happ joysticks) for acurate and responsive gameplay. The Astral Fighter comes with over 300 games, including many versions of Street Fighter, plus all the retro classics that we all know and love, such as space invaders - pacman and many more. This machine is guaranteed to provide endless hours of enjoyment for everyone, young and old alike. The Astral fighter is an ideal choice for home games rooms, offices, reception areas and various other venues. The machine is set on free-play by default but a coin operated version can also be supplied for an additional cost. The cabinets for these machines are profesionally manufactured using CNC routers, to ensure a precision finish every time. Lead time for manufacture is up to 28 days from the time of order. This machine is a custom made product - actual lead times may vary depending on manufacturing runs.